Saint Louis is a favorite stop of our family’s on our drive from Oklahoma to New York. It is about 4.5 hours from the Oklahoma eastern border. We usually stop for an early dinner or a late lunch. There are several restaurants in the riverfront district to choose from. We were boring and just ate at Subway, but everyone got what they liked! 🙂 The St. Louis Arch on the riverfront is a must see, especially the free Louis and Clark museum under the base of the arch. According to gatewayarch.com, “The structure was built as a monument to the vision of Thomas Jefferson and St. Louis’ role in the westward expansion of the United States.” The Jefferson National Expansion Memorial includes the arch, the museum and the park surrounding the arch. It was named after President Thomas Jefferson who was involved in the Louisiana Purchase and was instrumental in sending Lewis and Clark on their expedition to explore the American West. The museum, which is based on the diaries of Lewis and Clark, has a lot of information to read at each display, so I would plan on spending a couple hours if you have time to really get an understanding of Lewis and Clark’s journey. Park rangers are available to give informative lectures about the different displays. The gift shop is large and has a lot of educational gifts to purchase. A candy/old time type general store offers candies and replicas of toys from the early days of America. There is a ride to the top of the arch, which takes you on a ride inside egg shaped capsules to the inside of the top of the arch. The view from the top is magnificent, but I would not go to the top in the middle of summer as we did, as the temperature in the small observation room and in the capsules was close to unbearable. I guess it is hard to pump air conditioning all the way to the top of the arch! These three women have very different experiences, where they grew up, and where they live now. However, they are all happy where they are. Great stories! One of my friends from years ago—a friend who grew up in France and now lives in Canada—recently wrote on her facebook wall: I may not have gone where I intended to go…But I think I’ve ended up where I intended to be. I think that sums up Gloria’s, Sabine’s and Heather’s stories too. Each of these three women is exactly where they were meant to be! I grew up in South Korea and moved to study in America at age 19 right after high school graduation. I’ve lived in Riverside, CA and Tucson, AZ. Right now I live in Manhattan, KS with two beautiful girls, a somewhat boring but loving husband and a little Doxin boy, Boots. I love tranquility and small town feeling in Manhattan. I’d say it’s pretty safe here to raise kids and family. We had quite a treat a few days ago when we went to a Japanese/Korean restaurant. We made ourselves comfortable on “floor seating” (chairs without legs, a low table, and a secret cut-out area under the table below floor level for your legs). Very ingenious! I don’t think that the Japanese actually eat that way traditionally, but it was great I didn’t have to kneel the whole time. The food was beautifully presented, and delicious. I got a picture of the Bento Box, but the other food was mostly eaten before I remembered about the camera. My daughter’s arm got in the picture; she couldn’t wait to eat! We love to try different foods and ways of eating. This was our first “low table” experience. The restaurant only provided chopsticks for eating, which was fun, but a little challenging when eating the rice. What are some of your favorite cultural eating experiences? I would love to hear about them! Visit the Tallgrass Prairie near Barnsdall, Oklahoma. This beautiful wildlife preserve is like visiting Oklahoma when the settlers first came to this land. Wide, open spaces, tall grasses swaying in the wind and a lot of buffalo to enjoy. As the sign to the preserve states, “This is a space of quite in an increasingly noisy world”. The only noise was the sound of the wind, the lowing of the buffalo and the singing of the birds. Visit Barnsdall afterwards and tour the local Native American heritage museum for a peek into local tribal history. Hike at Gloss Mountain State Park. This small state park has large deposits of selenite crystal, which look like small pieces of glass shining in the sun. There are several trails, one which looks quite steep up the side of the mountain. The Gloss Mountains are more like large outcroppings jutting out of the otherwise flat landscape. Stations along the trail offered free selenite crystal pieces for visitors to take home. There are no bathrooms that I could see, so be sure to plan to visit one before going hiking. Dig for crystals at the Salt Plains State Park. The salt plains were created when a large lake partially dried up.The park is also a nesting area for several endangered species of birds. If you bring a bucket, shovel and clothes you can get dirty in, you can dig for crystals in the designated areas. There is also a visitors center, with a small nature display and a bathroom (always important). Note: It can get terribly hot in the summer when the salt reflects the sun. We went on a day in the upper 80’s, but on the salt bed, the temperatures reached over 100. Be sure to go on a cool day! 5 Things to do in Oklahoma when it is cold outside. Well, when I first thought about writing this post, it really was cold outside. However in typical Oklahoma fashion, today was 82 degrees. These are still some really fun places to visit whatever the weather. The Myraid Botanical Gardens in Oklahoma City: a lush floral garden in the middle of the city. There is even a waterfall inside! The Oklahoma Aquarium in Tulsa: this is by far the largest aquarium within hundreds of miles. There is a walk through shark tank, a lot of hands of displays for the kids, a large variety of fish and aquatic animals, along with a new turtle display coming soon. If you can make it, they also have a behind the scenes shark tank tour on selected days where you can walk on a catwalk above the tank. The Sam Noble Museum of Natural History in Oklahoma City: this one was a wonderful find for our family. It features a large area with dinosaur skeletons (including a two story high brontosaurus), an Oklahoma Native American display, insect collections, and other natural history exhibits. A wonderful deal too, for just a couple dollars a person. It is on the campus of Oklahoma State University. The gift shop and a large kids play/discovery area added to the charm of the place. The Oklahoma City Capitol building: what impressed us was the huge central dome painted a variety of pastel colors. They offer free tours to the public which we found very informative and engaging. If you go when the legislature in out of session, you can tour the Supreme Court of Oklahoma chambers. We also were able to tour the House of Representatives. My daughter got to pretend she was the Speaker of the House. The have a small gift shop, not much there, but the tour was worth the visit. Incredible Pizza in Tulsa: More than just pizza, this place has a huge buffet, with a fair amount of healthy choices, more games than any play-place I have ever seen. There is an indoor roller coaster, golf course, rides for small children, video games for the older kids and an indoor go-cart race track. It is a bit pricey: about $17.00 per person, but you get to play a LOT of games and you could stay all day, and go back to the food bar as many times as you want. Not a bad deal for a once a winter activity. So there you have it, the free to the slightly pricey things to do in Oklahoma in any kind of weather! Enjoy! This is a very unique way of looking at an area! 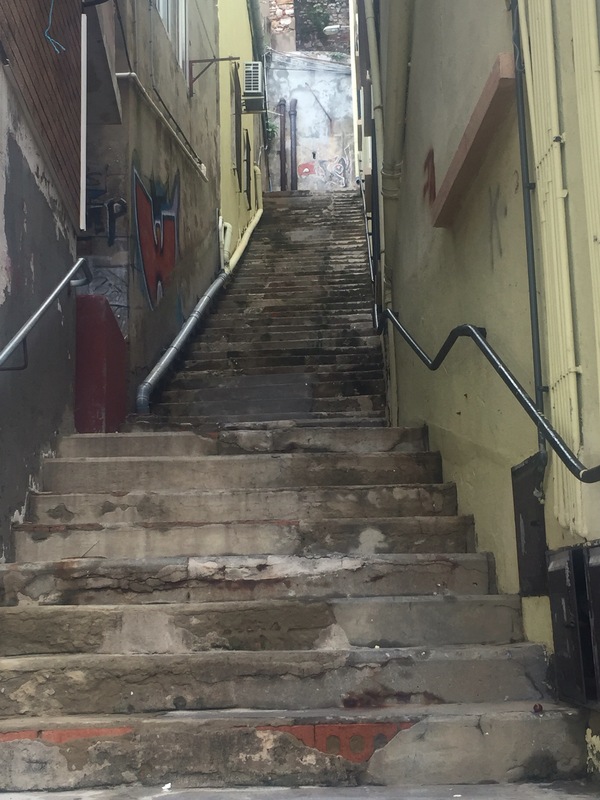 I love the stairs with the ramp for strollers (prams), but I don’t know if I would trust myself pushing my child up that huge incline! Here in the Midwest United States the land is mostly flat, so we don’t see a lot of stairs here, except the few in front of buildings. 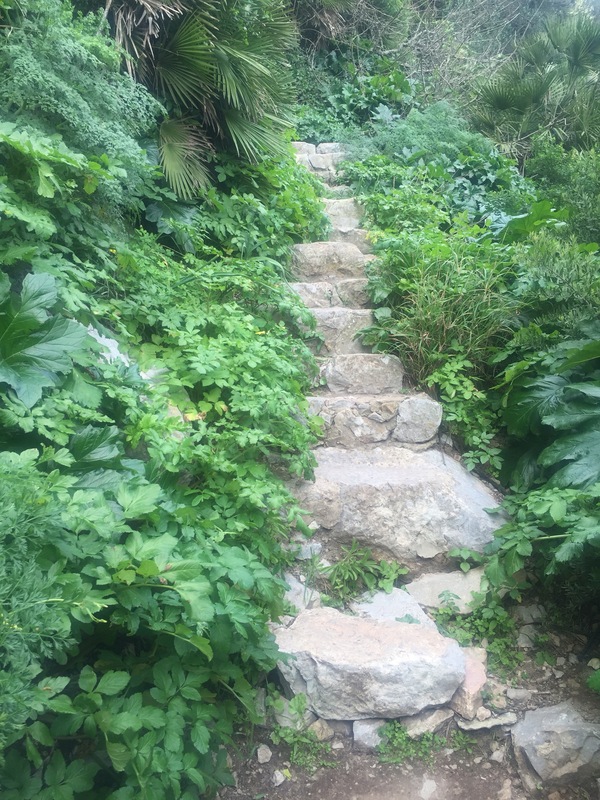 You may have noticed that recently steps have featured heavily in my posts, mainly because of my intention to compete in the Med Steps challenge coming up this spring. Well that got me thinking and do you know there are an awful lot of steps around Gibraltar?It might have something to do with the fact we live on a flipping great big rock and there is a lot of gradient going on! 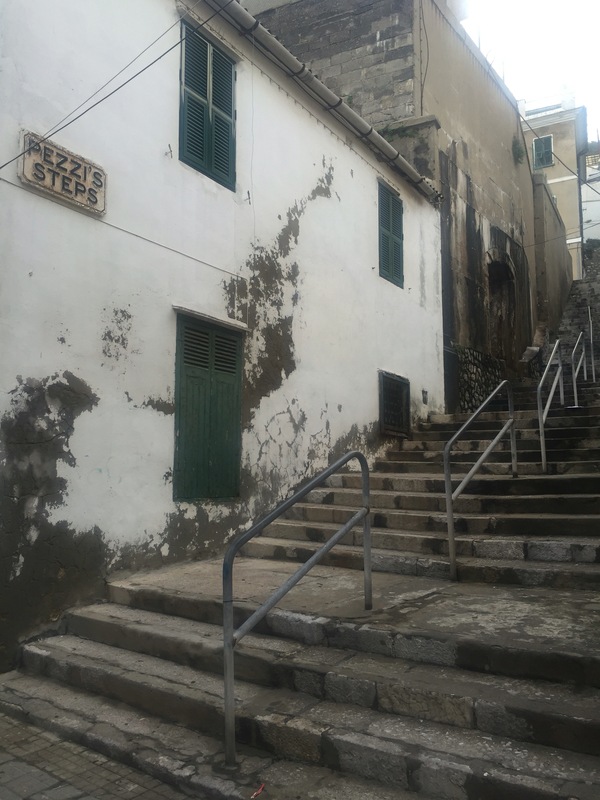 Another reason for steps is that they take up a lot less space than roads and for many people they are the only way to access their homes, particularly in the pedestrian reliant narrow lanes and passages of town and upper town. 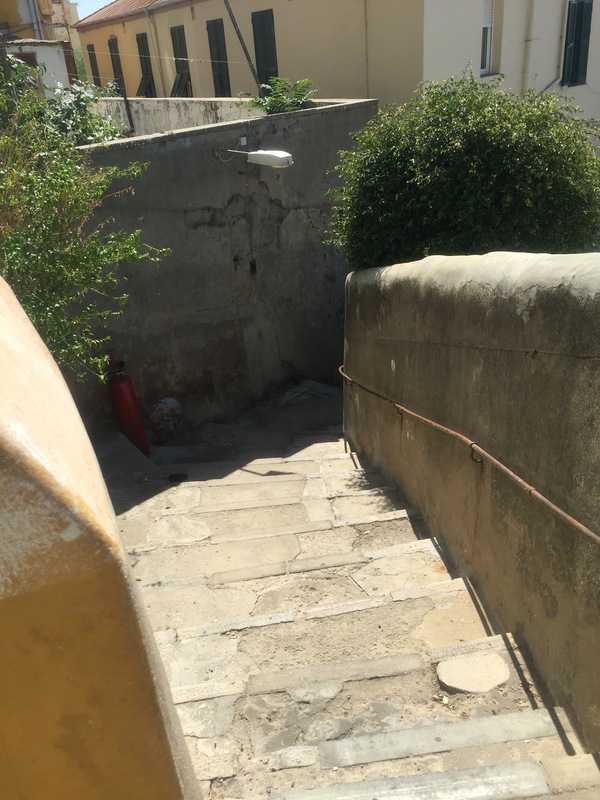 The steps here can be a real challenge, especially in the rain (which can make some of them very slippy) and in the hot summer when slow and steady is the order of the day. I didn’t quite know what I was walking into as I arrived at work before the break of dawn. When the night nurse told me, “I am so sorry”, I knew it could not be good. You see, I work on a trauma unit, which means we see a lot of the crazy stuff, such as car wrecks, ATV accidents, gunshot wounds, stabbings and motorcycle crashes. The injuries are one thing to consider, of course, the physical wounds. What I was not prepared for when I started nursing was the mental aspect of the patient care. Unfortunately, for many of these people, the reason they had a wreck or got stabbed or shot was because they were drinking a whole lot of alcohol, high on crack, or maybe were using just a few too many prescribed pain medications. As the day wears on, these patients start going through withdrawals, and it is not pretty. I struggle to maintain my own sanity when my new admit who crashed his ATV starts yelling, “I am leaving RIGHT now, I don’t need to be the f*** here!” while the sweet little old lady next door to him who fell and broke her hip is trying to sleep! Oh, and it just gets better. Then we have the patient who misused their pain medication at home, so now nothing we give them helps with the pain, and I am running into the room every hour to give them enough pain medication to kill a horse. By the time the shift is ending, that sweet little old lady with the broken hip has become a confused, scary demon who has tried to kick and bite me multiple times, since now she does not know where she is and is constantly trying to get out of bed! Plus there are the three other patients who have varying degrees of illness or injury. Add that to all the tests, surgeries, sudden chest pain, vomiting, heartburn and a myriad of ailments, and you have a very eventful day! Please note: No one’s privacy was violated in the writing of this post. The characters are a generalization of the types of patients I encounter as a trauma nurse. I hope you enjoyed my tale! The horse wreath was just to amazing not to post!